The stage was set for an action packed first race of the day. Alex Maloney with Molly Meech (NZL) had a commanding but catchable lead ahead of two chasers, Martine Grael with Kahena Kunze (BRA) and Charlotte Dobson with Saskia Tidey (GBR). A sunny Miami day at minimum wind strength meant it was guaranteed to be challenging conditions. 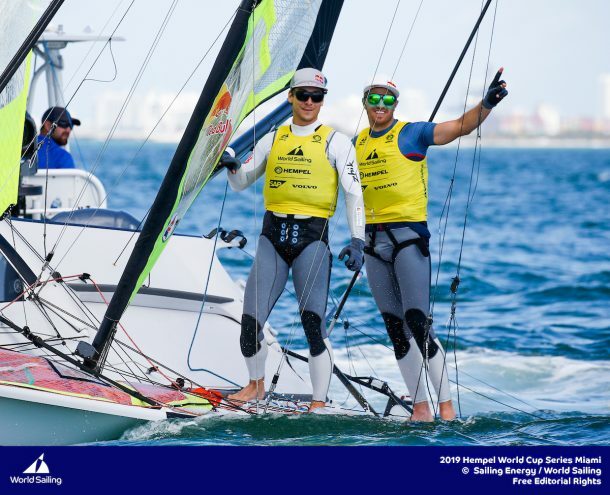 The pin may have been the preferred end of the starting line for the 49erFX Medal Race, the first of Day 5 of the Hempel World Cup Series Miami, but in light air there’s a lot of risk in starting in a pack. From race start, the Kiwis were under pressure, getting rolled at the start and having to tack out. Meanwhile, both Dobson/Tidey and Grael/Kunze had good starts, especially Grael/Kunze who won the boat on a last moment double tack. The Kiwis recovered nicely through with a slight gain on the bottom right of the course, a trend that would play out for the rest of the race. Most of the fleet straight set except for Grael/Kunze who gybeset, heading back to the side that kept paying on the beat. They passed two boats on the downwind, to only trail the Swedes by the leeward marks. Interestingly, the leading two boats rounded the go left mark, while Denmark’s Schutt and Christiansen rounded the go right gate. A third of the way up the beat it was the Danes who were up into second, while most of the fleet, and critically the Kiwis, were going left. Grael/Kunze then made the critical move, tacking back to the right and getting the farthest right of the leaders. By the top of the second beat they were back into second place, with the Kiwis falling all the way to ninth place. By the final downwind, everyone had figured out the power of the right side, and they all gybeset shutting down passing options. 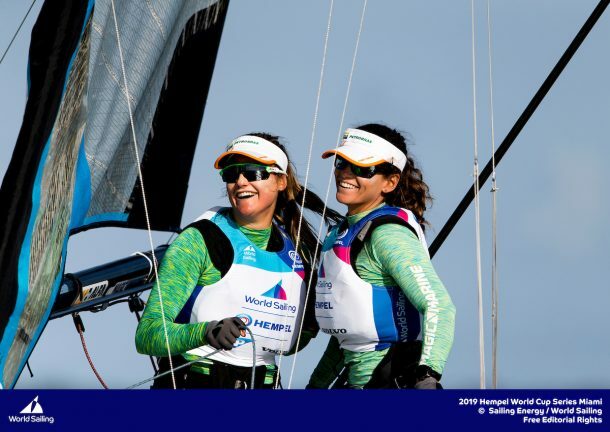 Brazil carried through to the finish in second, while the Kiwis closed tightly to the group in sixth through eighth, but couldn’t pass and ended up loosing their regatta lead. Once again, Grael/Kunze used their smarts and skills to create the conditions for an unlikely but simultaneously inevitable win. The damage from Maloney/Meechs disastrous medal race was limited to loosing just the one place overall, as they held on to the silver medal. While Dobson/Tideys fourth place finish wasn’t enough to make any passes, it kept them in the Bronze medal position. 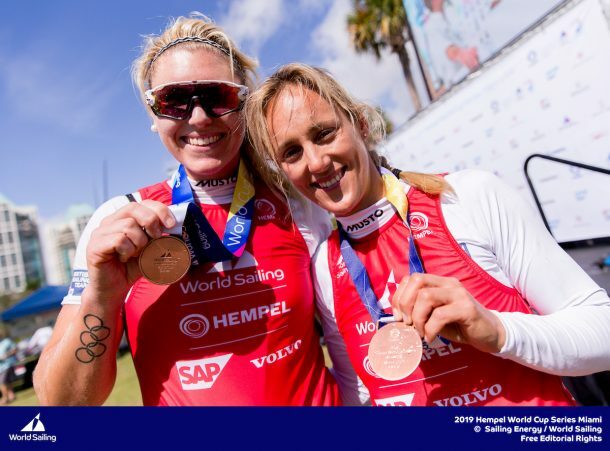 2019 Hempel World Cup Series ©PEDRO MARTINEZ/SAILING ENERGY/WORLD SAILING 01 February, 2019. ©Jesus Renedo/SAILING ENERGY/AARHUS 2018 02 February, 2019. The 49er Medal race followed next, and a filling of the breeze would prove critical. As the starting sequence was going, the wind picked up to 7 or 8 knots, and 10 degrees farther left of the first race. That put the pin end in a heavily favored position. By the time the starting gun sounded, five boats were over early – half the fleet, and critically only one went back to restart properly. Leaders, Heil and Plossel had a safe, mid-line start. Their closest challengers, Britain’s Fletcher and Bithell were the team who restarted, but were last up the first beat as a result, meaning the gold medal was all but decided. Also, with 4 of the 10 boats being disqualified for their early start, including the third-place team overall, Peters and Sterritt, the Silver was locked up too for Fletcher and Bithlell. All that remained was a fight for the Bronze. 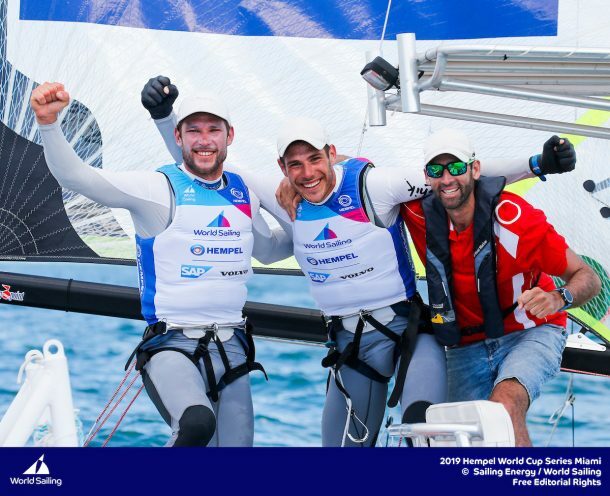 Germany’s surprise Bronze medalists from the 2018 World Championship, Graf and Fischer, did a safe, Port Tack Option start, and with a simple plan of heading to the right corner, got the layline correct and were first to the windward mark. They held on for the remaining laps for the win, but it was not to be enough to secure them a medal. The team taking the bronze was the Fantela Brothers from Croatia. They also kept themselves safe during the start, winning the boat end and sailed well through the race moving themselves up to second place by the finish, ultimately taking the Bronze by nine points. The win for Germany’s 2016 Bronze medalists Eric Heil and Thomas Ploessel headlines a four boat German squad in the medal race. It was a very competitive fleet in Miami, with 42 boats including virtually all of the contenders saving Burling and Tuke. For Germany to get four into the final is quite an accomplishment. Only one will make it to Tokyo, but they’ll be battle hardened and be sure to have a strong tuning partner in the final few weeks to the games, which can be a critical advantage. 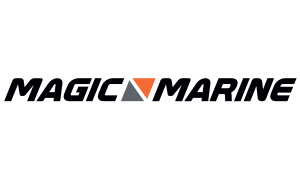 Miami 2019 was a very high scoring regatta for the 49er fleet. The leading Germans had a 9 point lead going into the final, with a scoring average greater than 7 points per race. Often a leader in most fleets will average a 3rd or a 4th, but the numbers prove out that in these light conditions and so many capable competitors, the 49er battle was quite a challenge. ©Jesus Renedo/SAILING ENERGY 02 February, 2019. Congrats to the World Sailing race officials and media team for getting the over early boats pulled out of the medal race which made the rest of the race watchable. Too often in years passed OCS boat were allowed to keep racing, which made the TV product difficult to watch at times.